Well, we thought we would bring you up to date on our travels. Leaving Waldron behind we made our way south, down I-75, heading for Cherokee, North Carolina and the Smoky Mountains. Cherokee is on the south side of the Smoky Mountains Park. Not wanting to drag the trailer through the middle of the park, with those winding up and down mountain roads, we detoured around the park, following I-40 to the east. Following this, so called, freeway was an adventure in itself. Yep, a curvy, winding, up and down, mountain road, with a 50 MPH speed limit. On the up side, it was a beautiful drive, with all the fall colors in full bloom. We found our way to Fort Wilderness Camp Ground, driving down a narrow road. Making our way up their driveway was another adventure. Lets just say it was a narrow, curvy driveway with a whole lotta UP. Two rigs could not pass on this driveway. Somebody would be backing up. Once you get into the park, it is a very nice wooded park, with tight turns and small lots. June and I got checked in and settled into our site. Our first day out was spent driving, getting the feel of the area, with some of it on the Blue Ridge Parkway. The scenery is spectacular, with all the fall colors and clear skies. These mountains are very impressive, for the most part, completely wooded, and very steep, at least in this area. Elevations are in the 5-6000 foot range. The amazing part is how these trees manage to hang on and grow on these steep grades. Pictures that we took do not do this place justice. With a name like Cherokee do you think this might be a Cherokee Indian area? You bet ya. We saw Indians dancing in the street, in front of tourist traps with bright pink and bright green feathers, begging for tips. Clearly not authentic, just making a buck. With that in mind June and I found an authentic reproduction of a Cherokee Village, complete with Indians. We had a guided tour, given by a Cherokee. She took us around to the various exhibits and explained each one while Cherokees were performing the various skills. Some of the things we saw were, basket weaving, arrow head making, beading, making and shooting a blow gun, making a dugout canoe, and making masks. The dugout canoe was very interesting. Before the white man brought metal to the Indians they used fire. A suitable tree was very carefully burned down, by digging out the roots and protecting the tree with clay. Once the tree was down it was cleaned up and a fire built along its length. Again protecting the wood that was to be left behind with clay. As the fire burned down into the log the ash was dug out with stone tools. One of the last exhibits was a talk, given to the crowd, explaining some of their history. Seems that the Cherokee rarely wore feathers and never lived in Tepees. Wanting to see more of the Mountains June and I headed out for a cross-country tour. After checking with Ranger Bob, we found a 14 mile dirt & rock two track (that would be 2 bicycle lanes) through the mountains. The road is one way. This became obvious when we started out. This road is carved into the side of the mountain its about 8 to 10 feet wide (that would be, rock face to drop off) and no guard rails. As we moved down the road there are places where if you go off the road you will have time to eat lunch before you stop if you don’t land in a treetop. But what a trip, a passenger car can make the trip, if you have the nerve. Wanting to see some waterfalls we ventured off to Rainbow falls. It was only 2.6 miles down(?) the trail, to the falls. Nothing to it, a short walk, even for us being out of shape……….. Up we went. This trail goes up and up for 2.6 MILES! Two hours later, we made it. A little trickle of water coming over the falls. NO, we didn’t climb to the top of the falls. It looked just fine from the bottom! Checking the map we found Juney Falls. With a name like that, we had to go. It was off to Bryson, NC, near Deep Creek Campground, to find the falls. We walked the park, along Deep Creek, finding Indian Creek Falls, Tom Branch Falls, then Juney Falls. We were saving the best for last, only .3 miles to Juney Falls from the main trail. 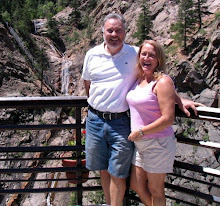 Yes, once again we were climbing, twice as steep as Rainbow Falls, only t-h-r-e-e t-e-n-t-h-s o-f a m-i-l-e………………. We made it, and had a nice rest on a bench at the falls. Friday is moving day, we are headed for Blairsville, Ga. to participate in, “Habitat for Fluharty”.